Founder: Enzo Ferrari (18 February 1898 - 14 August 1988). And F's first grand prix car had a supercharged 1.5-litre V12. 1951: Scuderia Ferrari won its first F1 GP, at Silverstone, with driver Froilan Gonzalez. 1953: Ferrari 250, 3-litre V12, front-engined, produced in various closed, open, and racing versions. The rare 250 GTO became a serious collectors' car; a 1963 example sold for £12 million in 2010. A 1962 example reportedly sold for £20.2 million in June 2012. A 1962-63 250 GTO Berlinetta sold for us$38.1 million in August 2014. A 1962 Ferrari 250 GTO, chassis #3413, engine #3413, sold for us$48,405,000 at RM Sotherby's Monterey auction in August 2018. A 1956 Ferrari 290 MM by Scaglietti, 3490cc V12, one of four built, chassis #0626, engine #7, gearbox #10 7 S, driven by Juan Manuel Fangio in the 1956 Mille Miglia, sold for us$28,050,000 at RM Sotheby's 'Driven by Disruption' auction, New York, on 10 Dec 2015. A 1956 Ferrari 290 MM by Scaglietti, chassis #0628, engine #0628, sold for us$22,005,000 at RM Sotherby's 'Petersen Automotive Museum' auction, 8 Dec 2018. 1957-1958: Four Ferrari '335 S' racers were built, 4023cc V12, 390hp. A 1957 Ferrari 335 S Scaglietti sold for €32,075,200, us$37,794,319 at the Retromobile Salon auction in Paris, 6 Feb 2016. 1957: A 1957 prototype Ferrari Testa Rossa racer sold for us$16.4m (us$14.9m + buyer's premium) at Goodings 2011 Pebble Beach auction. A 1959 Ferrari 250 GT LWB California Spider Competizione, chassis #1451 GT, engine #197 D, sold for us$17,990,000 at RM Sotheby's 6 Dec. 2017 New York Icons auction. 1964: Ferrari 275, 3.3-litre V12, front-engined. A 1967 Ferrari 275 GTB4*S NART Spider, chassis #10709, engine #10709 was sold for us$27,500,000 by RM Auctions at Monterey, August 2013. 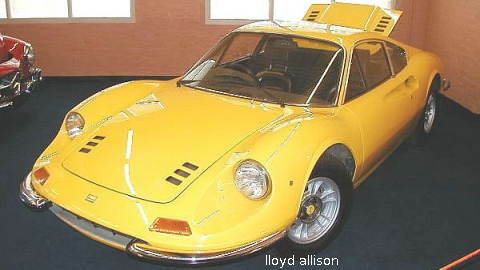 1967: Ferrari created the Dino marque, after Alfredino. The Dino 206 GT, mid-engined, 2-litre V6, is a beautiful little car. And, 1969, the Dino 246, 2.6-litre V6. 1968: Ferrari 365, aka Daytona, 4.4-litre V12, front-engined. 1969: Fiat took 50% of Ferrari, 90% after 1988. 1973: Dino 308 GT4 2+2, 2-door, 3.0-litre V8, mid-engined. In 1976 this was "rebranded" the Ferrari 308. 1984: The Testa Rossa was the successor to the 512 BB (1976) with a 5-litre flat-12 (rear-|mid-) mounted over the gearbox. And 1991, the 512 TR, 1994 512 M.
1988: Ferrari's 40th anniversary, and Enzo Ferrari (1898-1988) died. 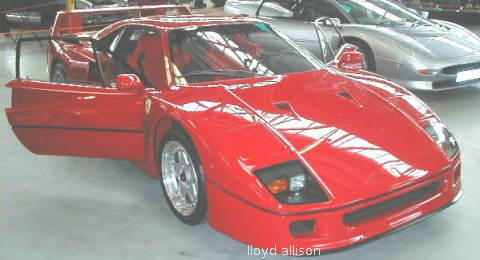 1988: Ferrari F40 introduced, 3-litre V8, twin turbo. 1994: Ferrari 355, 2-seat, 3.5-litre V8 5-valves/cyl., mid-engined. 1994: Details of the F50 released. 1995, shown at the Geneva Motor Show. 1994: Ferrari 550, 5.5-litre V12, front-engined. 1999: Ferrari 360 replaced to 355, 2-seat, 3.5-litre V8, mid-engined. 2002: Ferrari 575M, 5.7-litre V12, front-engined. 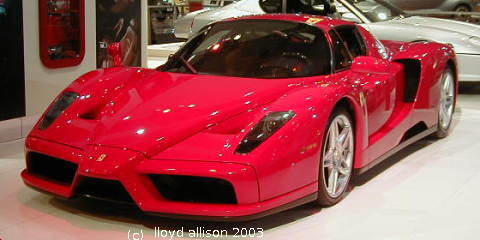 2002-2004: Ferrari Enzo, 6-litre V12, mid-engined, 350km/h (220mph), 0-100km/h 3.3 secs. 2004: Ferrari 430, replaced the 360, 2-seat, 4.3-litre V8, mid-engined. 2004: Ferrari 612, 4-seat, 2-door, 5.7-litre V12, front-engined. 2006: Ferrari 599, 2-seat, 6-litre V12 (~Enzo), front-engined, 330+km/h (206+mph). 2009: Ferrari 458 'Italia' at the Frankfurt motor show, 2-seat, 4.5-litre V8, rear- (mid-) engined, 325km/h (202mph), 0-100km/h <3.4 secs., combined fuel consumption 13.7 l/100km (320 gm CO2/km).. The first 458 was delivered in Feb. 2010, us$260K, £170K. The Ferrari 458 Italia was recalled in September 2010 after several had caught fire. The 458 was replaced by the 488 GTB. 2011 March: At the Geneva Motor Show, the Ferrari 'FF', had Four seats, 4WD(!) (not 'FF'), front engined 6.2 litre V12 post '612', £227K (12/2011). 2012 March: Ferrari unveiled the F12 Berlinetta (599 replacement) at the Geneva Motor Show, 6262cc V12, front engined, rear wheel drive -- delivery late 2012 to 2013. 2013 March: Ferrari unveiled the 350+km/h LaFerrari (?!) Enzo successor at Geneva, rear (mid) 789hp 6.2 L V12 + 120kW (161hp) Kers. 2015: The 488 GTB, 3.9-litre, twin turbo, V8, replaced the 458.